Plague of the Dead is a Creation that adds a new zombie creature type to the game. It was released on October 4, 2017 for 400 CC Credits. This Creation adds the quest The Rising Dead, which is automatically added to your journal upon installation, along with an anonymous letter. After reading the letter, you will be directed to a Ritual Site north of Southfringe Sanctum (map) to stop a group of Necromancers from using ancient magic to conjure zombies. However, once you get there you will discover that you are too late, as the site has been overrun with zombies. 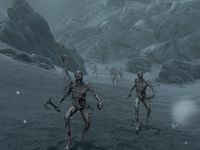 Indeed, zombie hordes will now randomly appear as world interactions all across Skyrim. You can also learn spells to summon zombies by finding the related spell tomes at the Ritual Site or as random loot. This page was last modified on 14 March 2019, at 00:14.